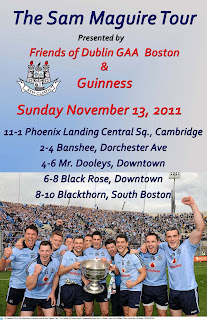 The Friends of Dublin GAA Boston and Guinness present The Sam Maguire Tour of Boston on Saturday November 12 and Sunday November 13. Dublin Manager Pat Gilroy, 2010 and 2011 Players of the Year, Bernard and Alan Brogan, as well as team members Michael Fitzsimons, Michael Darragh McCauley, Paul Casey, Eamonn Fennell, Rory O’Carroll, and David Henry will be traveling to the United States to share in the celebrations of Dublin’s marvelous victory. On Saturday night, November 12, there will be a cocktail reception at Porter Belly’s with music by Inchicore. There is a limit of 100 people so don’t delay in securing your ticket! On Sunday the cup and players will appear at venues throughout Cambridge and Boston. The day begins at 11:00am at the Phoenix Landing in Cambridge, 2:00 at the Banshee on Dorchester Ave, 4:00 Mr. Dooley’s, 6:00 The Black Rose, and 8:00 The Blackthorn in South Boston. This is a great opportunity to see the cup first hand and a chance to meet some of the heroes who delivered the first All-Ireland to Dublin in 16 years. Bring the kids for photos and autographs. Tickets for the Saturday night reception are $100 with the proceeds going to the Dublin Players Fund. 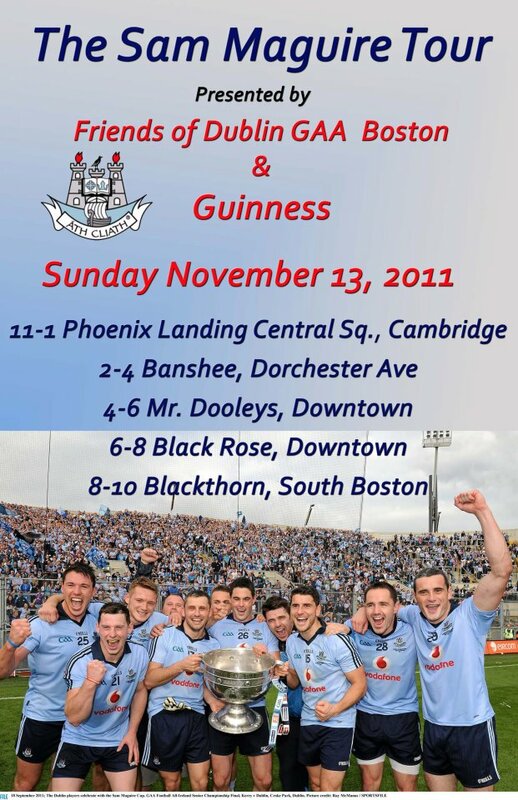 Please contact any member of the Friends of Dublin GAA Committee for tickets and information. Sean McCormack at (617) 840-2983, Rory O’Donnell at (781) 738-2783, Kevin Fagan, Brendan Mullen, Joey McCabe, Mick Sammon, Stephen Magill, or Paul Brennan. Also email rodonnell-1@comcast.net or sean@porterbellyspub.com.